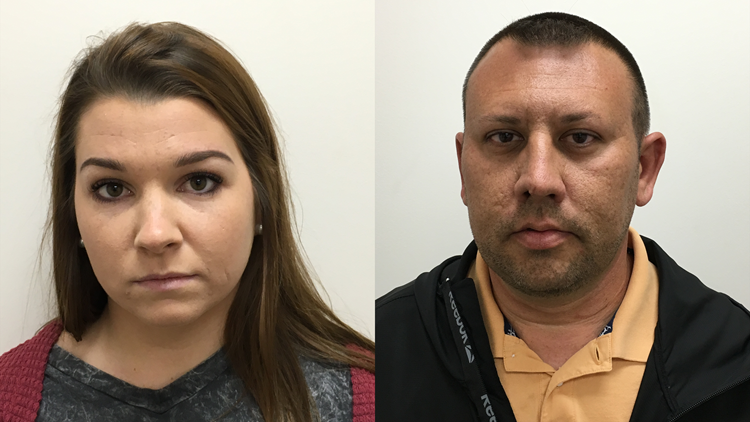 Haelee and Robert Blevins, the Jefferson County couple indicted for filing a false report to cover up a domestic assault. TBI agents said they believe Robert Blevins and his wife, Haelee, made up a violent encounter with the unidentified man to cover up a domestic assault. JEFFERSON COUNTY, Tenn. — A Jefferson County couple has been indicted after being accused of falsely reporting an assault incident, according to the Tennessee Bureau of Investigation. In March, TBI said special agents began investigating allegations involving Jefferson County commissioner for the 6th district Robert Kyle Blevins III, 38 and his wife, Haelee C. Blevins, 23. On March 23, Jefferson County Sheriff’s Office deputies responded to the couple’s home after a 911 call made by Haelee, according to officials. During the call, she told dispatchers that she and her husband had an argument that turned physical. When deputies arrived, the couple gave them a different story, stating they encountered an SUV on West Highway 11E when they were driving home. They pulled over and an unidentified man jumped out of the SUV and began hitting Robert, causing injuries to his face, according to officials. During the course of the investigation, agents said they determined the incident involving the encounter with the unidentified man did not occur and the couple fabricated the story to cover up a domestic assault. On Thursday, April 11, the Jefferson County Grand Jury returned indictments charging the couple. Haelee is charged with one count of false reports and one count of domestic assault. Robert is charged with one count of false reports, according to TBI. Monday, April 15, both individuals turned themselves in and were booked into the Jefferson County Jail on a $10,000 bond, according to officials.